Cook up a storm with fun ideas and recipes for cool, crazy, can-you-believe-it cookies! 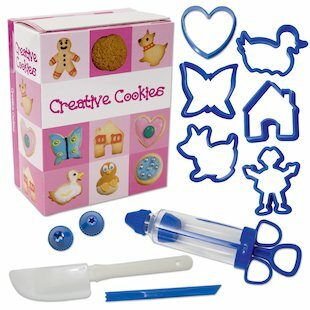 This dinky mini kit lets you bake and decorate cookies in all sorts of cute and fantastical shapes. Ducklings, hearts, houses, butterflies… just let your imagination roam! The kit is crammed with delicious cookie recipes and delectable dough flavours, plus all the tools you need to turn your scrumptious creations into a reality. Leaf through the book to get the funkiest ideas for making your baked bites look truly unique. Gingerbread people, iced hearts, or a little dog with a collar. It’s time to bake them all – and eat them all! Mini kit contents: hardback recipe book, cookie cutters, spatula, cookie tool, icing syringe and shaped icing nozzles. Great product and book, the icing syringe is fab! You can make really nice looking cookies with this set.